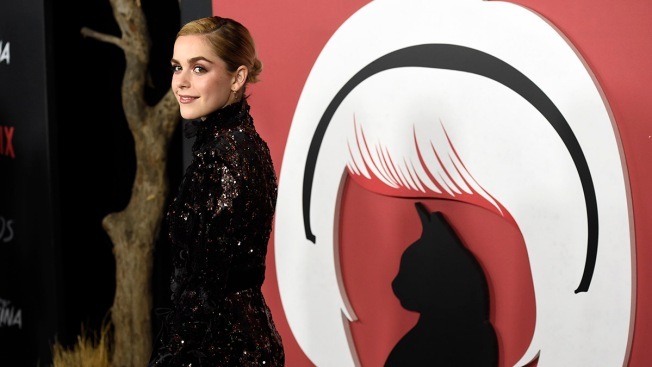 Kiernan Shipka, a cast member in "Chilling Adventures of Sabrina," turns back for photographers at the premiere of the Netflix series, Friday, Oct. 19, 2018, in Los Angeles. Kiernan Shipka, best-known as Don and Betty Draper's daughter, Sally, on "Mad Men," is learning a lot as the star of the new Netflix series "The Chilling Adventures of Sabrina." One of those lessons: She's allergic to cats, which can be a challenge if you portray a teenage witch whose black cat, Salem, is essentially her sidekick. In a recent interview, Shipka mocked a cradling motion and said, "There's a still (photo) of me picking up Salem like this. That's the exact moment I truly learned that me and cats are not compatible. .. I feel like ants are crawling all over my face." She said she first tried taking a Benadryl to combat the reaction and jokes it was so potent, she doesn't even remember filming that day. Shipka is the latest in a number of "Sabrina the Teenage Witch" iterations over the years. The most recent being a 1990s comedy with a laugh track starring Melissa Joan Hart. Shipka said she's never seen the Hart version but does intend to watch it one day. "I hadn't seen much or any of the 90s version just because it was a little bit before my time," laughed the 18-year-old. "I'm curious to see it. I definitely think one day I will go back and watch it. I sort of just wanted my own separate Sabrina." In "The Chilling Adventures," this Sabrina is a teen struggling with her identity. In the first episode, we meet her on the eve of her 16th birthday when she's supposed to choose to go full-on witch or live a normal life. "I think that a lot of her struggle is figuring out a way to balance her worlds in a way that isn't catastrophic, and that's a humongous undertaking because the witch world and the mortal world just don't mix really." Shipka met with creator Roberto Aguirre-Sacasa last December to talk about the series, tested for it twice and waited what "felt like an eternity" to find if she got the part. "It was really Tuesday through Friday," she laughed. She found out she got the role last December and shooting began in Vancouver in March. Filming is already underway for season two. "I didn't know about any of this a year ago. It's crazy how quickly it's all happened," she said.